Headlines: Fishing has been excellent over the last week. Some days were horrific with wind, but anglers were still catching fish. The lakes have provided the most reports and Eucumbene has produced yet again with some excellent baitfishing with Mudeyes and Powerbait the fly fishing and trolling has been outstanding. Rivers:- Levels have had a top up with recent rain and this augers well for the spawning season. 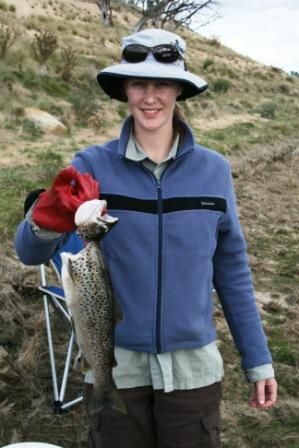 The Thredbo and Eucumbene have both been fishing well. We should see some good day time hatches with the cooler evenings. Nymphs will start to be a good choice of fly at this time, but be prepared to change to a dry if fish start taking off the top. 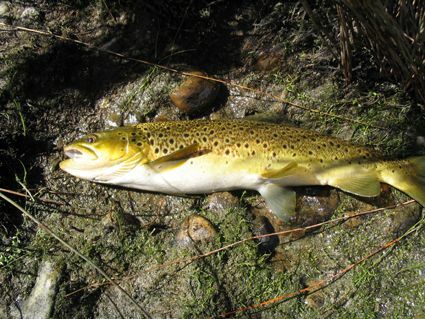 Searching or casting at a sighted fish with a dry has been working well in the glides and slow pools of the Eucumbene and Thredbo. A dry indicator with a weighted nymph has been the best option in the faster runs at the head of pools. Lake Eucumbene:- Mudeye hatches have slowed but there is still plenty of food around the edges to keep the fish in range of a fly fisher. Location is all important. Bays with lots of grass weed are ideal and rocky points adjacent to these bays being very good too. 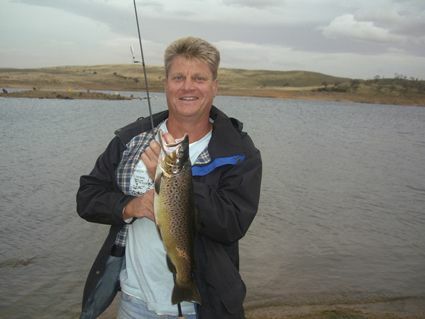 The bottom end of the lake has been excellent including Braemar, Coppermine, Collingwood, Waiunui Buckenderra, Rushy Plains, Sevengates, Springwood, Yens and Old Adaminaby are the best options. 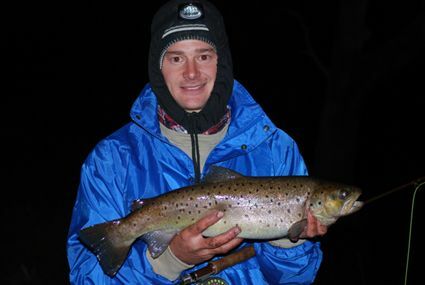 *Vic and Bill from Queanbeyan had a great session on Friday night catching eight Rainbows between them. The fish averaged 1 kilo with a couple being over this weight. Old Adaminaby was the general location. Had a short session Friday night at Rushy, lots of caddis and some fish on them, copped a couple of bumps and 2 hookups but both fish busted me off in the weeds on 8lb tippet, will be upscaling to 12lb. Had a Saturday afternoon/evening fish at Anglers Reach though the lake was glassy and conditions not easy got a couple of working fish on a red tag (photos). Though the easterly killed what was a promising night. As Im a slightly un-obsessed angler couldnt help myself and fished the river up top Sunday after lunch. Lots of small fish plus a couple of better ones to 2lbs best flies were para-duns wasnt off the water until dusk and got home late. Im still not popular at home, not sure why? 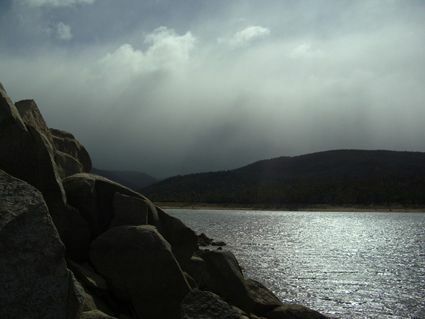 Lake Jindabyne:- Reports from Jindabyne have increased with some top fishing and polaroiding. There have been some big Browns caught on wets after dark and the conditions on the weekend were great for polaroiding. Below are some great fish caught out of the lake on the weekend. Fish were coming on late overall but worth the wait. Dom with a horse of a Brown! Just a short note re the fishing at Jindabyne. My son Stephen and I were there when the big low front came through on Thursday and the wind was terrific !! to say the least. Gusts to about 100km an hour so it made fly fishing pretty difficult !. crayfish in his stomach and one of them (about 1" long ) was still alive. In all we took 7 fish in very difficult conditions..
As promised, a few photos and a bit of blurb to go with it. Wednesday Morning the 2nd of April saw Dad and I leaving cnaberra at around 9.00am. Dad had driven fro orange that morning so was quite happy to relax in the passengers seat for an hour or so until we reached Cooma where we stocked up with drinks and food and motored on up to The Alpine Angler. This Tackle shop has people coming and going all the time and the boys are also busy sending off gear through the mail that has obviously come in from the internet and post. I live in Batemans bay and as we walked in started a conversation with a fellow that had just come back from my neck of the woods catching Snapper, Bream and Flathead. It never ceases to amaze me how Fishing brings all sorts of people together, breaking down all barriers giving all a common background and future to speak about. afetr 15 minutes or so we broke conversation and started speaking with the boys ahbout what sort of lures I needed to beat Dad in the Fly Fishing department. Lured up we set off for our 2.5 day trip. We hit Jindabyne about lunch time, booked into The Jindabyne Hotel/Motel and set of for the Boat Ramp just shy of The Snowy Arm. We had been listening to the weather report and that was why we chose to go up that as to try and get out of as much wind as possible. Dad and I had been planning this trip for a while and you are so pleased when you actually get there and are nearly ready to fish WHEN just after launching the 14ft A Sea Brooker, have the motor running awaiting Dad to get back in and go; you look up to find he has the 4 wheel drive and trailer bogged against the side of the lake. The first things that came out were alittle hash MAYBE; however why had he gone along the side instead of solid ground is anyones guess. So after a quick Father Son discussion we laughed and dug the 4 wheel drive out and got into the fishing. 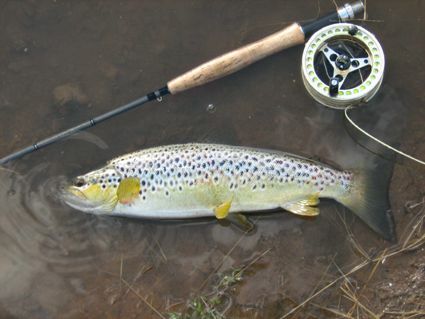 Now it wasn't long till we found a fish or two in the form of Brown Trout. These fish were right up against the edge feeding on Yabbies lurking in the weed. I had dropped Dad off on the bakk and headed off to do some trolling. This not working to well, in fact not at all and with the wind getting that strong it was sending waves back to where we had come from in a hell of a hurry. We decide we would head back to the little bay around from where we had launched the boat. No sooner had we pulled into the bay which was actually reasonably calm compared at least to around the corner we could se sveral trout rising. 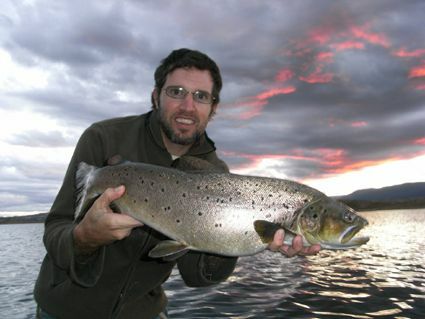 One in particular seemed oversized fro a Trout to me. With the weather and night closing in we thought it time to pull the boat out and have a couple of beers and talk about the day's events. At this time I realised that Dad and the Fly Gear were up in actual keepers 2 to nil for Steve and his Lures. 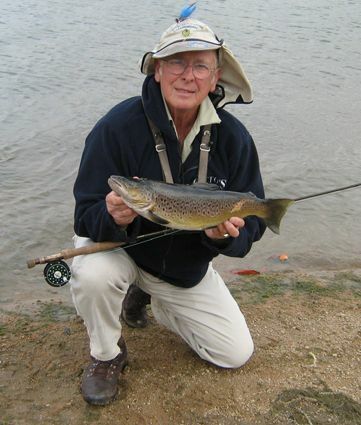 Although I can use a Fly Rod quite well, it has always been a competition between Dad and I catching Trout whether it be in a Lake, River or Stream. Next morning after a great breakfast supplied with the accomodation deal we headed straight up to where we had been the day before. This time we are there just after sun rise and several fish are working the surface. Tom from The Alpine Angler had giver me a selection of lures including a brown Tassie Devil. 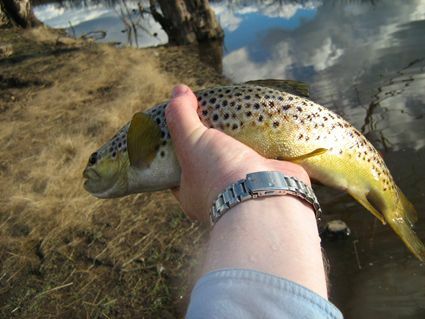 I put this lure on because I thought it would lok like a little brown trout. Just as I did my oversized fish rose about 15 meters away. I let the rod flip the lure about 2 meters in front of where he had rolled his massive body. All I saw was about 3ft of this fish and his girthe looked to be the size of a basket ball. The lure was bought back in on a fairly slow retrieve and about the sixth turn of the handle he was on. When you catch anything that has abit of size about it you can feel the weight in your hands and tis fellow was no different. About twenty feet or 6 meters I had him on for when he just spat the lure out. Although I had lost him the feeling was great as I hade seen what I had on and at the end of the day I would have taken a photo of him and returned him for another angler to experience the same. Dad and I cruised up towards the Snowy Arm again, pullin into different bays and tying the tinnie up to a log and then working the weed banks. I had by now put another Tassie on that tom had recomended and when dad saw it he laughed at the Brilliant pink lure. He was trying to work out what it would replicate with me not caring as long as it brings me fish. We had a lot of fun that day, or at leats I did with the brilliant pink lure casting from the banks with a slow retrieve, the mostly browns from 3/4 kilo to maybe 3kg were hitting it about 3ft to 12 ft from the bank. I even stood side by side with Dad and cast where he was casting the Fly and he could not believe that the fish would follow this thing in such shallow water. We checked our Tally and agreed that as in most cases we were pretty much even on the count. A good time was had by all and we headed back to The Alpine Angler on our way home, picked up a bit more gear and headed for home. We will certainly go back to Jindabyne or maybe Eucumbene next time. Our thanks to the Alpine Angler for their help and supply of gear. See you next time Lad's. The new natural coloured Mirashad minnows have worked on a few fish this week too. They are a dead set ringer for the Crucian Carp that are in the lake. 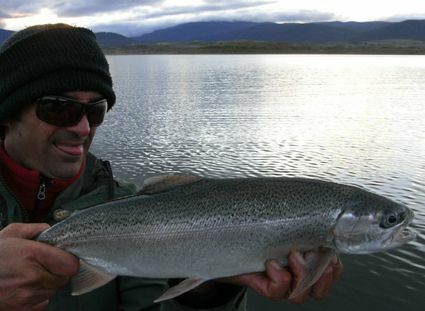 *Jarrod from Canberra caught a nice Rainbow trolling at Waiunui on a Alpine Angler Cobra in pink. (Sorry Jarrod but the camera won't upload the photo) My apologies. Plenty of rainbows around on the weekend, powerbait was the bait of choice. This nice brown caught by my wife Annette is her first brown. Caught near Buckenderra. Headed up to Wallace Island via Seven Gate Rd and fished on the side facing Old Adaminby. We started fishing around 19:00 and hooked up 6 nice pieces in a matter of 3-4 hours until the wind changed to a N/NW at 22:00. 1cm piece of bardie grub and a ball of powerbait (rainbow) on a size 8 hook was the best. The fish looked noticeably fatter than the last time we were there (exactly 1 year ago). There is much more vegetation and insects around the place.